Dashiell Hammett and Raymond Chandler may be the architects and set the unbeaten standards of the tough but caring detective, it is clearly Cornell Woolrich who has set the standard for the psychological thriller. He was a mainstay of the Mystery/Thriller pulp magazines of the 1930s and 1940s. According to Wikipedia (which I hate to quote), “His biographer, Francis Nevins Jr. [a respected pulp writer in his own right], rated Woolrich the fourth best crime writer of his day, behind Dashiell Hammett, Erle Stanley Gardner and Raymond Chandler. A check of film titles reveals that more film noir screenplays were adapted from works by Woolrich than any other crime novelist, and many of his stories were adapted during the 1940s for Suspense and other dramatic radio programs.” And while I’d consider him a ‘crime writer’, his writing was in a class by itself…Hammett and Chandler on one branch of a Mystery Tree and Woolrich on another branch. The Cornell Woolrich Omnibus contains Rear Window (which lacks the romantic aspect of the movie version) and other short stories as well as two novels, I Married a Dead Man and Waltz into Darkness and it is in these novels where his talent shines. He is a master at allowing his protagonists to get what they desire but, the question is, at what cost? Woolrich is an artist who paints a scene, then another and then another, all the while moving the story forward, inch by sometimes excruciating inch. In Waltz into Darkness, particularly, I didn’t know whether to root for the main characters, Lou and Julie/Bonny Durant, love them or hate them or feel sorry for them. My feelings changed by the page and at one point I was tempted to read the last page to see how the story ended. But I”m glad I didn’t, because it would have ruined the suspense. The two novels take place in two different times, I Married a Dead Man in the 1940s when the story was written, and Waltz into Darkness in 1880s New Orleans and he does each time period justice. In the latter, readers feel like they are in New Orleans, he sets the stage so well. I’ve read various Cornell Woolrich stories and novels (Rendezvous in Black) and I haven’t cracked the surface of his works. There are definitely going to be more in my future. If you are into reading the best of a genre, then Cornell Woolrich is a must read for every mystery fan. His works are well written and suspenseful. P.S. A biography of Woolrich might be in order as well, as his life would have made a great Woolrich story. 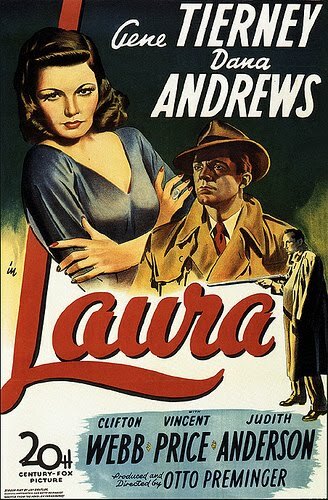 I’m going to end my stream of noir movie posts with Laura, the 1944 movie with Gene Tierney, Dana Andrews, Clifton Webb and an incredibly young Vincent Price before he became the king of horror movies. I think this movie is better than The Maltese Falcon and on a par with Casablanca, so after almost 20 movies watched Laura and Casablanca top my list. Clifton Webb is outstanding as the snobbish Waldo Lydecker, the radio personality who takes credit for bringing culture into the life of beautiful Laura Hunt (Gene Tierney). Dana Andrews plays the hero but down to earth cop, Mark McPherson, who falls in love with Laura from the portrait hanging over her mantel. And finally the ne’er do well but suave southern gentleman, Shelby Carpenter is perfectly played by Vincent Price. This movie has just the right amount of action, romance, suspense and regardless of the number of times I’ve watched this movie, I never fail to remain spellbound. 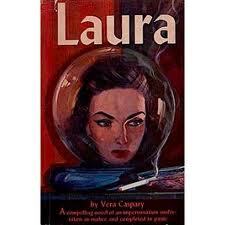 Which brings me to the book, Laura by Vera Caspary. I forget which book of hers I read first but whichever it was prompted me to read more. I’ve liked all I’ve read so far, not all mysteries. But there was something puzzling in the book to film transition of Laura. As you can see, Waldo Lydecker in the movie is rail thin. 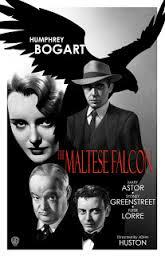 However, in the book he is obese–think of Syndey Greenstreet in the Maltese Falcon. The question is why the change? To accommodate Webb who was substantially better than Greenstreet would have been? Whatever the reason, it continues to puzzle me. Just to let you know I have both the movie and the book of Laura at home. That’s got to say something, right? So, thus ends my noir movie rampage. Thank you Nova Ren Suma for writing Dani Noir and thank you Dani for suggesting all of these movies. It has been fun watching. I’ve come to the conclusion that the directors of Edward G. Robinson movies don’t know when to end them. They tack on an extra few minutes that ruin the movie and so it was with Scarlet Street starring Robinson, Dan Duryea and Joan Bennett as another great femme fatale. Robinson, named Chris Cross in the movie, has just left his dinner celebrating his 25th year at the bank where he is manager when he happens upon Duryea slapping Ms. Bennett in the street. He intervenes and Duryea runs away. Of course mealy mouth Robinson falls head over heals for Bennett, in part because she’s beautiful and in part because he’s married to a shrew. Little does Robinson know that both Bennett and Duryea are a team of schemers and see a sucker in Robinson. They play him along and Bennett has him wrapped around her little pinkie, so much so he paints her toenails before she goes out to dinner…with someone else. As with all noir movies, something goes amiss, there’s a dead body and someone gets blamed. The characters, the action and the story are great. 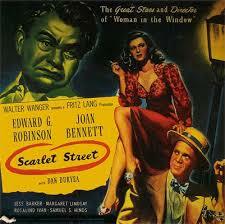 Duryea plays the best slimeball around, in both Scarlet Street and The Woman in the Window. Bennett is marvelous at playing Robinson. And Robinson makes a great patsy. But just like The Woman in the Window, the last two minutes ruin it. If you watch it, in my mind the scene on the train should end the movie. But, that’s me. Just don’t miss these two great movies. I’m into the classic noir movies now and decided to make it a Humphrey Bogart trifecta (The Maltese Falcon, The Big Sleep and Casablanca), although, where there’s Humphrey, there also seems to be Peter Lorre and Sydney Greetstreet. And while Rita Hayworth and Joan Bennett are front runners in the femme fatale roles, Lauren Becall, Mary Astor and Ingrid Bergman clearly outpace them in the ‘love interest’ category, as well as in sophistication. There’s no need to summarize the plots of these three classic movies. I’m not sure I’d call them noir movies either, although they are mentioned in Nova Ren Suma’s book, Dani Noir (remember, that’s what got me started on this whole noir movie kick). They are star studded, action packed, well acted, absorbing movies. The actors are a delight: Sydney Greenstreet, Claude Rains, Peter Lorre, Lauren Bacall, Mary Astor, Ingrid Bergman. 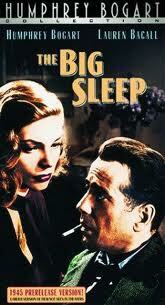 Of the three, Casablanca has to be my favorite, followed by The Maltese Falcon and lastly The Big Sleep. I could, and have, watched the first two multiple times. If I had to choose a femme fatale, it would have to be Ingrid Bergman. I know I’m rambling here, so I’ll end by saying these three movies define great movies. See them. You’ll never tire of them. This week’s installments have been good to me. The first movie I watched was Detour with Tom Neal and Ann Savage, who plays a savage woman. Tom is thumbing a ride from New York to Los Angeles to see his girlfriend. 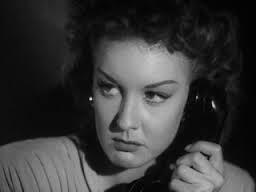 I’m trying to figure out a way to explain the movie but it’s getting convoluted in my mind, so let’s just say there’s a dead body and an irate woman who manipulates Neal, in the form of Ann Savage. And if this last name doesn’t describe the character to a T, then I don’t know what does. Neal tells the story in flashbacks while sitting at a bar. The actors, the cinematography, the story, the action, the tension are all good. Neal is convincing as a down on his luck guy on the lam. Savage is fantastic in her role as a jilted, manipulative, screeching albatross around Neal’s neck. If she didn’t win an Academy Award for this performance, then the judges were off their rockers. Was Detour my favorite? 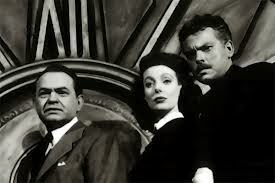 No, but it is sure up there as is The Stranger with Edward G. Robinson, Orson Welles and Loretta Young. Robinson is a Fed tracing Nazis and has been led to the small town of Harper, CT. There is little evidence as to who Franz Kindler really is, but circumstances lead to Welles who’s reestablished himself as a professor and about the marry the daughter of a Supreme Court Justice. There is action, drama, and superb performances. Welles, yet again, never ceases to amaze me with his characters and his directorial achievements. And the more I see Edward G. Robinson, the more I like him. He may not transform himself as does Welles, but he’s just a joy to watch. No femme fatales in either of these movies, so Rita, Joan, there are no contenders for your title. And the even better news: I just found out that Robinson, Dan Duryea and Joan Bennett (The Woman in the Window) were in another noir movie together: Scarlet Street. That’s on tomorrow’s agenda, time permitting. Thanks to Dani Noir, I am seeing some great movies. The Woman in the Window may have been my favorite noir movie so far…until the last 2 minutes, which in my opinion, ruined the noir tenor of the movie. 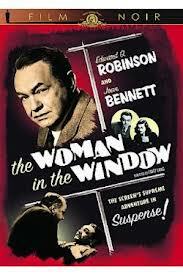 Joan Bennett is the woman in the window…a portrait in the window next door to Edward G. Robinson’s men’s club. (Talk about one sultry femme fatale…although she really isn’t ‘fatale’ in the movie.) After dinner with his friends, the local district attorney and a doctor, Robinson is ruminating over the portrait in front of him when the model, Ms. Bennett appears. They chat, go out for drinks and before you know it, Robinson is back in her apartment. All is innocent but Bennett’s jealous lover, a prominent financier, unexpectedly enters and gets the wrong impression. He gets Robinson in a stranglehold and Robinson, to save himself, stabs and kills him. The rest of the movie is the cover up. Robinson’s friend, Raymond Massey, is the district attorney handling the case, so Robinson gets constant updates. There is suspense galore, dark, shadowy streets and alleyways and all three main characters are so well cast. If there was a way to give you a two minute warning, I would, so you could turn it off at the right time. However, you might as well watch the whole thing because 105 minutes of pleasure is worth the two minutes of pain. By the way, Joan Bennett will give Rita Hayworth a run for the money. And there is just something about Edward G. Robinson, isn’t there. Now let’s move on to noir movie clunker number 2, after Touch of Evil . It is D.O.A. starring Edmund O’Brien. O’Brien, mysteriously decides to take a vacation in San Francisco. He stays at a hotel hosting a sales convention, goes partying with some salesmen, has a few too many and feels sick in the morning, but so sick he sees a doctor. After running tests, it’s determined that O’Brien was poisoned. 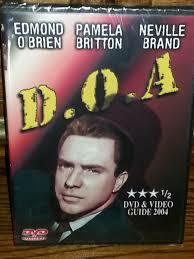 O’Brien, an accountant in the movie, spends the rest of it trying to determine who poisoned him. From the dialogue to the action, this movie just didn’t make it. The storyline is convoluted. The love interest is uninteresting. And there certainly is no femme fatale. If you’re determined to see a movie entitled D.O.A., I suggest to see the 1988 movie with Randy Quaid. Although the story is different, the poisoning is the same and this one is a lot more suspenseful. Since I’m halfway through the noir movies mentioned in Dani Noir by Nova Ren Suma, it’s probably time for a recap. As far as femme fatales go, Rita Hayworth is certainly on top, with Joan Bennett a close second. There is no close or even distant third. Regarding the movies, Gilda still remains on top with Lady from Shanghai and The Third Man battling head to head for second place. The Woman in the Window is trailing only because of the lame ending. Audrey Totter passed away this week at the age of 96. To most of you this won’t mean much. But in reading her obituary it mentioned that she played femme fatale roles in the 1940s and 1950s noir movies, including a bit part in The Postman Always Rings Twice, which I recently saw. I do remember her part. So, I picked the most noir photo I could find for this post. 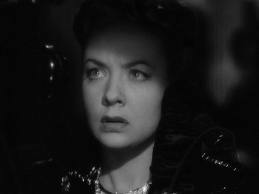 Included in her list of movies was Lady in the Lake based on a Raymond Chandler novel, The Unsuspected, High Wall and Tension. Beginning in the 1950s, she worked mostly in TV. So, in addition to the remaining movies on my Dani Noir list, I have several more to watch. This whole noir thing may become a lifelong pursuit.